“Barrack 38” was built in the summer of 1938. It was a part of the “small camp”. Among the first prisoners in the barrack were Sinti and Roma. After the November Pogrom in November 1938, at times over 6,000 Jewish prisoners occupied almost the entire “small camp”. Up to 400 people were penned up together in a barrack which had been planned to contain 150 prisoners. Barrack 38 and the neighbouring Barracks 37 and 39 became known in the camp as “Jewish barracks”, until 1942, since it was Jews who were kept there for the most part. Following a directive given by Heinrich Himmler, the Jewish prisoners from all camps were deported to Auschwitz in October 1942. Afterwards, the SS predominantly kept prisoners from Poland and occupied Western Europe in the barrack, as well as a group of women in early 1945. The barracks were also temporarily used for female inmates during the time when it was used as a Soviet Special Camp (1945-1950). 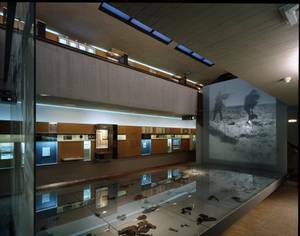 In 1961, barrack 38, reconstructed from original parts, was integrated into the “National Memorial Sites” as the “Museum of the Resistance Fighters and of the Suffering of Jewish Citizens. In 1992, shortly after the Israeli Prime Minister Yitzchak Rabin’s visit, an arson attack destroyed the B-wing of the barrack and significantly damaged both the other wing and barrack 39. The attack is a part of a string of extreme right, xenophobic and anti-Semitic attacks in Germany since 1992. The reconstruction was completed in 1997, five years after the destruction. The “Barrack 38” museum was designed and built by the Frankfurt architecture firm, Braun, Voigt & Partner, and seen from outside, it reflects the plain architecture of the destroyed barrack wing. The inside was expanded by adding a basement and designed as a museum. The traces of the arson attack, protected by glass partitions, are integrated into the exhibition as an exhibit and mark the passage to the restored old barrack building. The exhibition “Jewish Prisoners in Sachsenhausen Concentration Camp 1936-1945” is chronologically structured into four periods and uses the example of 74 life stories to document the fate of Jews in the Reich’s capital city. The Stuttgart architect Prof. H.G. Merz’ design of the exhibition takes advantage of the building’s two stories. The descent into the basement marks both the beginning of the war and the radicalisation of the National Socialist persecution of Jews associated with it. To begin with, the stories of individual Jewish prisoners who were imprisoned between 1936 and 1938 either as politically or socially persecuted individuals and as victims of the “Nuremberg Racial Laws” are presented on the ground floor. The first mass arrests based exclusively on racial ideology took place after the November Pogrom in 1938. From the beginning of the war in 1939 until 1942, the Jews in Sachsenhausen were subjected to continuously worsening prison conditions and abuses which became increasingly systematic. The camp SS carried out several campaigns of mass murder of Jewish prisoners. Between 1942 and 1945, while the National Socialists committed the genocide of European Jews in occupied Eastern Europe, the Jewish prisoners in the Sachsenhausen Concentration Camp were forced to labour in several “specialist commandos”, as in, for example, the “counterfeiters’ factory”. Over the course of the war and with the impending defeat of the “Third Reich”, from the summer of 1944 on, the direction in which people were deported was gradually reversed. Thousands of Polish, Czech, Slovenian and Hungarian Jews were transported out of their homelands or directly from extermination camps into the Sachsenhausen Concentration Camp. For the most part, they were put into the satellite camps. The SS still murdered thousands of Jews in the last weeks before the liberation in April/May 1945; in the satellite camps, on the death marches and in the extermination facilities of the Sachsenhausen “industrial yard”.